December 02, 2017 : Locate your binoculars, moon fans. Charge up your camera, space nerds. Or just clean your glasses, sky gazers. On Sunday, Dec. 3, this month’s full moon will be a supermoon. A supermoon occurs when the moon is full (or new, but that’s no fun) and its orbit brings it closer to earth than usual. A full moon and the moon’s perigee -- the point in its elliptical orbit when its closest to earth -- don’t line up all that often. On average, we get a supermoon when the moon is full roughly once every 14 months. Sunday’s supermoon will be this year’s only full-moon supermoon. For those of us in the northern hemisphere, we are getting an extra-super supermoon because supermoons in the winter months look larger. In winter, the Earth is closer to the Sun, and the Sun’s gravity pulls the moon closer to Earth, making the moon look bigger. According to Space.com, the moon’s average distance is 238,000 miles (382,900 km) from Earth. 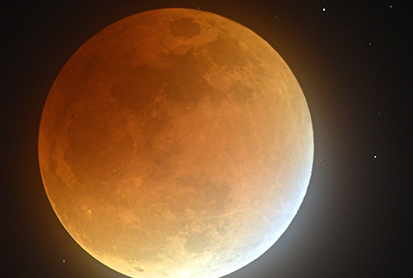 The moon will reach its perigee on Monday, Dec. 4 at 3:45 a.m. ET and be 222,135 miles (357,492 kilometers) away from Earth. It will reach official full-moon status at 10:47 a.m. ET the day before, Sunday, Dec. 3. When these two events collide, the full moon will appear about 14 percent larger and 30 percent brighter than a full moon when the moon is at its apogee, or its farthest point from earth. It will look 7 about percent larger and and a 14 percent brighter than your average full moon. The best time to peep the supermoon is right after the moon rises. When it sits just above the horizon, the moon appears bigger and brighter than when it’s higher in the sky. That’s because, thanks to an effect called "moon illusion," you compare the moon’s apparent size to hills, trees and buildings when it’s low in the sky. This makes it appear extra big and bright. Where I live in New Hampshire, the full moon will rise on Dec. 3 at 4:42 p.m. ET. Check Timeanddate.com for your local moonrise time. If you want to catch the full moon right at its perigee, those of us on the East Coast will need to stay up super(moon) late or set your alarm for an extra-early wake-up call to get outside in the wee hours of Monday, Dec. 4 (3:45 a.m. ET, to be exact). Also, check your local weather forecast and keep your fingers crossed for clear skies for the night of Dec. 3 into the early morning of Dec. 4. If overcast skies are expected for that evening/morning, then you can get a supermoon preview on Saturday Dec. 2. The moon won’t be quite as full that night but will still look bigger and brighter than usual. Same goes for Monday Dec. 4 when it will be just past full but still look big and bright. If you plan to bring your camera and tripod for this year’s one and only supermoon, then we’ve got tips on how to photograph a supermoon.